When you’re carrying a trailer behind you, it stands to reason that you are carrying something somewhat valuable somewhere important. However, you eventually have to leave it somewhere, like at a storage area, or even at a rest stop while you go to the bathroom. And any number of things can happen in so short a time frame. The trailer can get stolen, for one thing, especially if you’re carrying something that someone would want. The best way to defend against this is to lock down that trailer hitch, which is what we’re here to discuss. 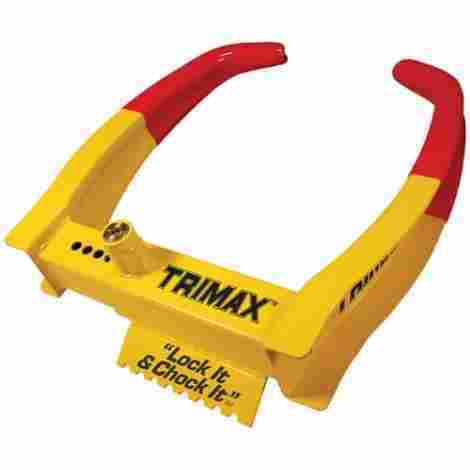 Kicking off our list, we have the Trimax Wheel Chock Lock. When it comes to trailer hitch locks, there are few more trusted names to get the job done right than Trimax. As we will see throughout this list, they’re one of the best manufacturers of trailer hitch locks out there. 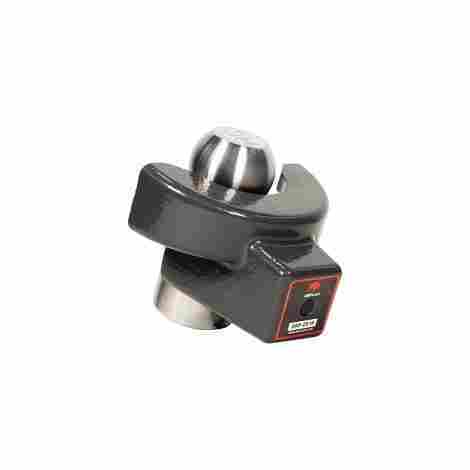 And nowhere is that better exemplified than with the Wheel Chock Lock. Never have to worry again about leaving a hitch lockout in the rain where it can get worn down by corrosion or rust. This lock’s special smooth powder coated finish makes it incredibly corrosion resistant. While not completely incapable of being worn down, you can leave this thing out for several rainy days on end without so much as a scratch. The lock on this device is almost impossible to pick. For one, a lock cylinder on its own is one of the harder types of locks to pick. But you add onto that the fact that getting into it the right way takes up to 3 different keys just to get it off of your wheel, and you have a lock that will serve you well. For a high-quality lock, this trailer hitch lock is actually very reasonably priced, given what it’s offering you in exchange. There are cheaper locks on this list, Trimax and otherwise, but the price for this lock is very well earned. 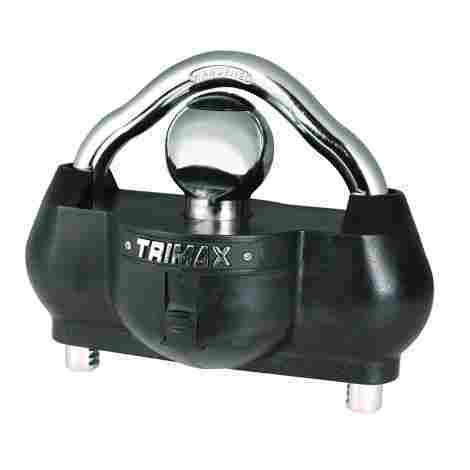 Coming in at second place, we have another Trimax product, the Trimax Solid Hardened Steel Trailer Lock. This 6 pound trailer lock is one of the best reinforcements you could ask for if you’re nervous about the quality of your trailer hitch. So, what makes this hitch lock so great? Let’s take a look and find out. We say this is solid hardened steel, we mean it, but we’re also leaving out a few other key details. For one, it isn’t just solid hardened steel that this lock is made out of, but it’s also ballistic grade nylon used for the housing. This makes this lock one of the toughest on the entire market. The last thing you want is for someone to come and pick your lock and get away with your trailer. But another thing you want to avoid is dirt and grime getting into the keyhole because then no one can get into it. Fortunately, not only does this lock come with a dual ratchet lock system that’s incredibly hard to pick, but it also comes with a sturdy keyhole cover. Obviously, a lock made from such high-quality materials wouldn’t come cheap, but thankfully, this lock isn’t much more expensive than the previous entry. You’ll usually find them for around the same price, so if you can afford one, you can probably afford the other. Rounding out our top 3 segment, we have the Amplock RV/Trailer Coupler Lock. As the name implies, this lock isn’t just meant for your trailer, but can also be used when you’re pulling something as large as an RV. No matter which you’re using it for, this lock will keep what you’re pulling behind you locked in place. This hitch lock uses Amplock’s push and lock system, a system that’s made this company famous for their user-friendliness. All you need to do is push this thing onto your hitch firmly, and voila, the lock has completely mounted itself onto your trailer hitch. And don’t worry, it’s just as easy to take off as it is to put on. So, once it’s on, how do you get it off? Simple, instead of a normal key and lock, you have an identification key system. While the key and lock are still there, there’s an extra layer of identification that the person unlocking the hitch lock needs to pass, so even a deftly handed pickpocket can’t get in. The big problem with this lock is its price. It is, without question, one of the most expensive hitch locks out there right now, easily coming in at hundreds of dollars at least. While the materials used and the technology it includes make it worth your money, there are much cheaper entries on this list that are likely much more attractive. In our #4 spot, we have the famous Master Lock, with their Swivel Head Receiver Lock. if you know anything about locksmithing, or even just use padlocks around your house, then you have definitely heard of the master lock. They are the indisputable jack of all trades when it comes to locks, and nowhere is that clearer than with the Swivel Head Receiver Lock. Receiver locks are already one of the easiest kinds of locks out there for newcomers to use, but this Master Lock Receiver Lock is one of the easiest even by that measurement. All you need to do is get it into position, push the body of the lock firmly onto the pin and then remove the key. Nothing more, nothing less. You’re probably worried that such a small, thin lock would be easy to break or corrode, but you don’t need to worry at all. Sure, there isn’t a whole lot that makes up this lock, but what it is made out of is incredibly durable, helped by some truly ingenious design choices. The best thing about this lock is its price. Master Lock’s popularity comes partly from their craft, but also from their ability to craft such great locks for affordable prices. And this lock is a far cry from the wallet muncher that was the previous entry. 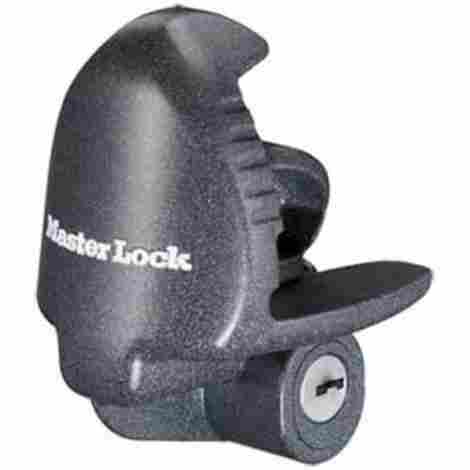 Coming in at #5, we have the Master Lock Receiver Lock. There are a lot more differences between this and the previous entry, besides one having a swiveling head and one not. There are quite a few other key distinctions that make this model its own specimen. Which we shall go over now. Every good hitch lock has some kind of method for defending against the ravages of the elements. This receiver lock’s method was to include tough weather seals and a watertight cap to keep as much rainwater, dirt, and grime out of the lock as possible. While not a foolproof method, once using it, you won’t be able to argue the results. Though touted as a trailer receiver lock, there’s actually a wide variety of uses for this lock. You can use it for RV’s, for normal vehicles, and almost any kind of trailer you could be pulling behind you. This is especially good if you’re a family person, and thus own two different vehicles, one for you and one for your spouse. While a bit more expensive than the previous entry, this receiver lock is still among the cheapest on this list. So, if you need a good old-fashioned receiver lock with no funny business and a good price, then this is the lock for you. 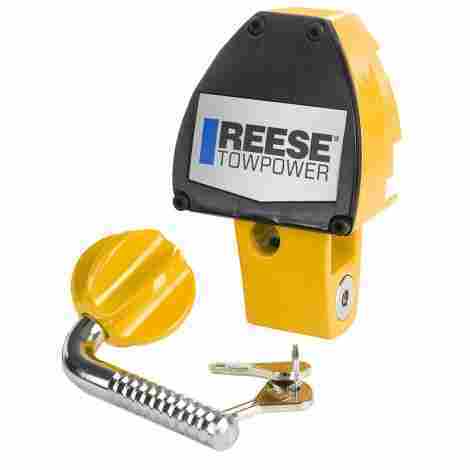 Coming in at #6, we have the Reese Towpower Universal Coupler Lock. This is the lock you go for when you need some heavy duty coupling for a good affordable price. Made from a mix of high-quality aluminum and steel, this lock is guaranteed to keep whatever you hitch to it locked down and secured. Let’s take a look and find out how they do this. Most hitch locks are built to resist picking, but with a lot of them, if the crook wants it bad enough, they’ll get it one way or the other. Fortunate, then, that this lock plans for “the other.” Picking is, of course, near impossible with this lock, but it’s also highly resistant to drill-outs, as well as simple prying. This lock is built to withstand almost all methods, new and old. 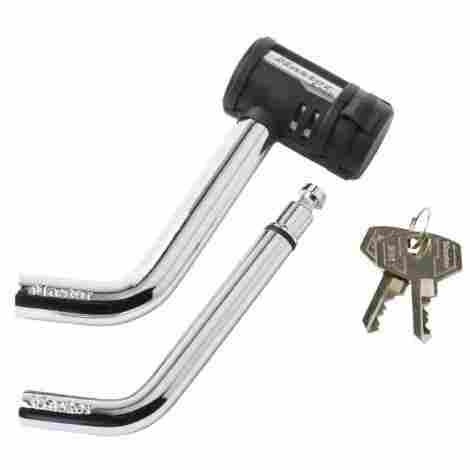 This lock comes equipped with an adjustable ratchet design, which you can adjust exactly to your liking. Not only that, but this lock can be positioned almost anywhere on the car in question, with around 11 locking positions. Once again, we have a very good price for this trailer hitch lock, with it barely costing more than the previous entry. 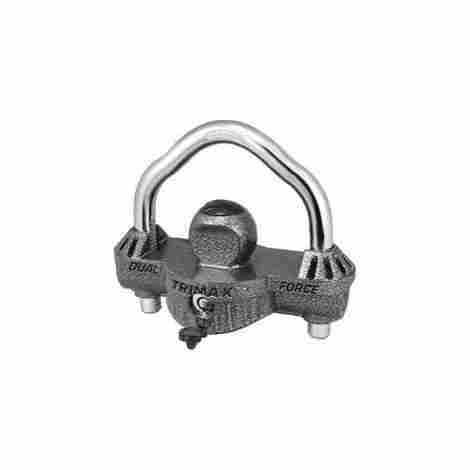 Which is a very good price, for what is one of the sturdiest and most versatile trailer hitch locks out there right now. In the #7 slot goes the Master Lock Trailer Coupler Lock. Like other coupler locks on this list, you’ll find this one being used for everything from RV’s to trailers to so much more. Of course, that isn’t all that it has to offer, as is the usual case with a Master Lock product. So what else does this lock have going for it? Let’s find out. The best way to ward off a lockpicker is to get a lock that needs more than one key to open. This makes the tumblers even more complex, with only the most skilled lockpickers (who probably have better things to do than steal random people’s trailers and RV’S) able to get into it. Which is why this lock requires two different keys, kept on their own keychain for convenience, to install and remove the lock. It stands to reason that such a large thick piece of metal like this lock is would be rather tough to beat. Indeed, if you’re worried about a would be lockpicker getting sick of trying to pick this lock and instead opting to break out the aluminum bat to do it the old-fashioned way, don’t be. This lock will be able to take anything man or nature can throw at it. This lock is a bit more expensive than the previous two entries, though thankfully not by much. You’ll usually find this lock for reasonably good prices, and at worst, it’s no more expensive than the first entries on this list. 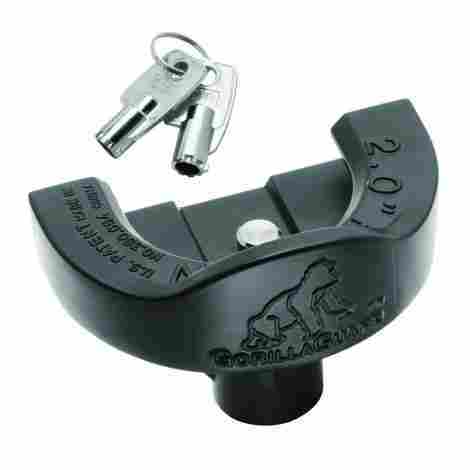 Kicking off our final 3 entries, we have our #8 pick, the Tow Ready Gorilla Guard Coupler Lock. Once again, we have another high grade, heavy-duty coupler lock that can take anything a man or nature can throw at it. So, what makes this lock so great in a more specific sense? Let’s find out. If a lock can’t be picked, the would be thief’s second option is to take a hammer to it until it comes off. This is a risky move, however, as that makes a lot of noise. Fortunately, this coupler lock is strong enough to take any swing your average man can throw, just enough times for the thief to be noticed. Even if the thief knows how to pick the lock (and considering the type of keyhole this lock uses even that is unlikely) they’ll find the lock itself is specially built to impede them on this task. Most lockpickers use special lockpicking devices these days, and this lock is specifically built to make it as hard as possible to use those kinds of devices, and to make physically picking the lock as tiring and tedious as possible. The Gorilla Guard is priced very averagely for what it is, giving you a very high-quality coupler lock for a very affordable cost. 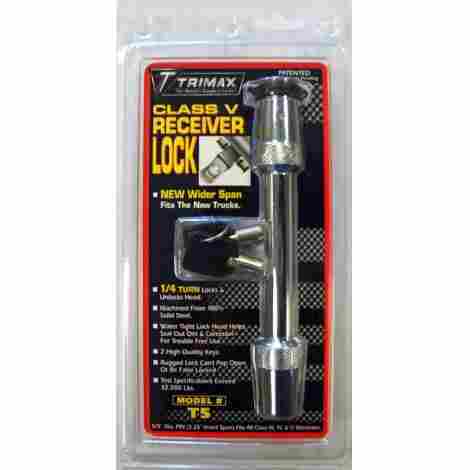 In our Second to final entry, we return to our friends at Trimax, with the Trimax Class V Extended Receiver Lock. Made from 100% high grade stainless steel, this receiver lock, despite not being as high on the list as other Trimax entries, still has quite a bit to offer that got it on the list. Like we said previously, every type of lock has their own different set of options for keeping out dirt, grime, and water. Receiver locks are no exception to this, as proven by this lock’s O-ring seal. This keeps the dirt, grime, and water from the outside away from the lock’s most vital areas. So even if every other inch gets dirty, you can be sure that the part that really matters will stay high and dry. Receiver locks have two technical weaknesses; their tendency to “pop” open, and their tendency to false lock. This refers to, respectively, their tendency to come unlocked at complete random, and those moments when you swear you locked it properly, but it turns out to not be truly sealed. This receiver lock won’t give you either of those problems. Like before, you’ll find this lock priced very fairly for what you’re being given. It could stand to be a bit cheaper, given its small size, but considering the high grade of the materials used to make it, it makes sense that the price would be ratcheted up a bit. Ending our list on a high note, we have our final Trimax entry and our #10 spot, the Trimax Universal Dual-Purpose Coupler Lock. Quite the mouthful, isn’t it? But regardless, this is a very high-quality lock, despite its placement on this list. So, what got it onto this list, to begin with? Well, for starters. Unlike other couplers, which need to be adjusted and re-adjusted depending on the type of coupler you’re working with, this coupler lock can be used on pretty much any kind of coupler type and work just as well as anywhere else. The last thing you want to be rusted is a hitch lock. Because you need to unlock it eventually, and if the mechanism rusts, then it can’t do that. Which is why this lock is covered in a rust proof hammer tone epoxy finish that keeps the metal underneath from rusting. The main drawback for this lock is its price. Not that it’s incredibly high, it’s definitely nowhere near as high as our #3 spot, but for what it’s offering, the price may be a bit too high for some people to be able to put up with, and it may be annoying for them. In conclusion, the main reasons to buy a trailer hitch lock are pretty self-explanatory. It doesn’t take a genius, after all, to see why you would need a device like these, as they’re very simple devices with equally simple appeals. They keep your trailer secure. Whether it be keeping them from rolling off when you have to park them on an incline, keeping them from getting stolen if you don’t trust the neighborhood you’ve parked in, or just keeping the trailer attached to your car when you don’t trust your hitch to be able to do the job on its own in a satisfactory manner. There’s a lot that goes into making a good trailer hitch lock, which we will get into in the criteria segment up next. But for now, we want to make it clear that we think every single entry on this list is worth your time and definitely your money. We can say with all certainty that there is not a single bad entry on this entire list. if, say, #10 sounds like something that would work for you better than #1 or #4, then, by all means, give it a try. These ten are the very best when it comes to trailer hitch locks, and every single one is worth the trouble. As we said, there is a lot that goes into making a trailer hitch lock work properly. Locks by themselves are complicated machines, but you add on the fact that they need to hold onto two incredibly heavy machines at the same time and you suddenly are left with a lot more plates that you need to keep spinning. The following are, in no particular order, the most important plates that we felt any good trailer hitch lock should keep spinning. If there is any machine more paradoxically complicated yet expected to be simple to use than the average locking mechanism, then we haven’t found it yet, and quite frankly we’re okay with that. Locks, and especially trailer hitch locks, should not be as hard to control as they are to make. They should be as simple as putting them on the hitch or wheel or wherever your lock needs to go to work properly, and then turning the key to lock them into place. There are complications sometimes, yes, but any complications there should be for the betterment of the lock’s efficiency. Such as the lock needing two keys instead of one in order to lock more securely. If a thief can’t pick your lock, then the next best thing is to take a hammer to the lock until it falls off the old-fashioned way. The drawback to this plan is, besides the possibility of this proving that you (the hypothetical thief) are a genuine weenie who can’t swing a hammer to save your life, is the fact that even if you get the lock off, you’ve just made a lot of noise. The best locks are going to be able to take whatever a thief can dish out, whether it’s a drill that’s meant to destroy the tumblers, giving the thief access, or a hammer to knock the lock loose. While no lock can hold up to continued assault with heavy enough objects indefinitely, they can at least last long enough for either the thief to get caught in the act or give up and go home before that happens. It is rare indeed to find any kind of lock not made out of steel, high-grade aluminum, or something similar to those materials. After all, the whole point of a lock is to make sure that people cannot get into something, so it would be rather embarrassing to spend $30 on a trailer hitch lock only for it to be made out of balsa wood and koala tears. Like we said, high-grade metals like stainless steel or aluminum are the most commonly used materials for any kind of lock, and especially for trailer hitch locks. But that’s not all that goes into making a good lock. The big thing that separates a trailer hitch lock from your average, run of the mill padlock is the fact that a trailer hitch lock is designed to be used outside. It’s meant to be used through the pouring rain, snow, and strong winds. And the main thing that a lock has to worry about in this scenario is rust. As such, the metal that the lock is made out of will usually be covered in some kind of rust or weatherproofed coating which will reinforce the metal’s resistance to rust and the weather events that can cause it. The most weatherproofing tends to be focused on there the mechanism of the lock is, since that’s the main concern of the lock itself. Everywhere else on the surface of the lock is just there to keep the mechanism housed and secured. But if the mechanism becomes rusted, then there’s no more lock, it’s just a hunk of metal that is now permanently stuck to your trailer hitch. The methods of weatherproofing a trailer hitch lock differs from lock to lock, depending on what type of lock it is. Now, this is where things start to get tricky. It seems like something that’s easy to grasp; a hitch is a rather simple thing to latch onto, so you wouldn’t think it would be all that hard. However, that all depends on the shape of the lock, and where on it you need to attach the lock. Sometimes it doesn’t even go on the hitch at all, like with receiver locks or wheel locks, which are meant to keep the trailer from wheeling away, which is useful if you park it on an incline. How complex a lock is depending on what kind of lock you’re dealing with. Some are very simple to use, while others are going to baffle you even years after you first buy them and after very regular use. You would think that price would be where things get simple, but then you would be wrong. The thing about the price of a trailer hitch lock is that the price will generally be higher or lower based on how many features it has, what materials were used to make them, and what it can do. However, this is not always the case, as two otherwise identical locks can have vastly higher or lower prices from each other for seemingly no discernable or justifiable reason. In most cases, it depends on the brand of the lock in question, as many locksmiths have a different opinion on what their products are worth compared to other companies. Ultimately, finding the right price for your trailer hitch lock shouldn’t be too hard, as it’s all a matter of finding the right brand that sells at a rate you can afford. You’re putting a shocking amount of faith in a trailer hitch lock when you buy one. It may not seem that way at first, but you’ll very quickly learn that there are a lot of uses for a trailer hitch lock than it first appears. Like what, you may ask? Well, to answer that question, here are a few other, related questions that people commonly have about trailer hitch locks. Q: Why would I need a trailer hitch lock for an RV? A: RV’s are much larger than a normal trailer, and carry a lot more weight, being essentially a house on wheels. As such, your trailer hitch may need some help keeping that RV attached to it. This is especially true if your car or truck isn’t used to or flat out isn’t built to handle loads that large. Having that extra locking mechanism on to provide some extra insurance to keep the RV attached goes a long way to easing some otherwise frayed nerves. Q: Why would someone even want to steal a trailer to begin with? They can’t be all that easy to steal. A: Very true, but it’s less about stealing the trailer, and more about stealing what’s on the trailer. This could be a motorcycle, a bunch of equipment or tools, a lawnmower, or some other large object that has no place to be carried on the back of your car or truck. These objects can be very valuable if sold to the right person but unless the thief has their own trailer, then there’s likely no way they can steal what’s on the trailer and leave the trailer behind. And even if they do, they’d have to let down the gate, and if you know anything about trailers, you know that doing so would pretty much give away the entire game. So instead they just cut their losses and take the whole trailer. Besides, everyone needs a trailer for something at some point, so there’s no downside to stealing it besides, you know, the police. Q: Okay, so how exactly does a trailer hitch lock help then? A: Every type of trailer lock helps to deter thieves in some form or fashion. For instance, a coupler lock keeps the hitch, and the trailer hooked up together and keeps them from being removed without the keys. And on top of that, even if you steal one of the keys, some of these locks require two or even three keys to unlock. And then you have locks like wheel locks. These are essentially the commercial equivalent to “the boot,” the big metal bar hooked onto the wheel of a car to keep it from moving. Now you need to be a bit more particular about these locks, because if you have a big, heavy duty trailer, then you need a big heavy-duty lock. Otherwise, the minute the thieves drive off, as long as they floor the pedal right away, the wheels will just crush the bar.